Cruising on the highway at maximum speeds can be adventurous, right? Well, when it comes to paying for all the gas you put in your car, travelling at high speeds is really not that fascinating; rather, it is a burden on your wallet! In the post, we are sharing six fuel-saving tips with you. Gas consumption is directly proportional to the speed you’re driving at. The higher the speed, the more fuel your car uses. So the simplest way to reduce fuel consumptions is to slow down. Driving at an average speed of 55 miles per hour on the highway will improve gas consumption by up to 10%. In 2013, in the United States 134.51 billion gallons of gasoline were consumed. Drivers often complain that their fuel tank empties before the expected time. But it’s not always your vehicle causing the trouble; maybe the gas is leaking out because the gas cap has not been tightened properly. Fuels, especially gasoline, tend to evaporate quickly when exposed to the air. Therefore, ensure your gas cap is properly secured after filling up at the pump. Regularly using the air conditioner can greatly add to the vehicle’s fuel consumption – almost up to 10%. On a mild temperature or cooler day, rely on airflow through the vehicle’s ventilation and turn off the AC. Tires use quite a bit of energy, extracted from the fuel burnt to keep the vehicle moving. But if the tires are underinflated then it’s more likely that they will use more fuel to tackle rolling resistance that the vehicle experiences. To save fuel, remember to check the tire pressure at least once a month. Your vehicle needs maintenance and regular checkups, which keeps its’ performance up to the mark and keep it fuel efficient. For questions on your next scheduled visit, contact your service advisor. 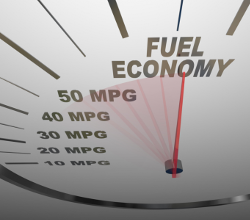 Fuel consumption mainly depends on the car itself. Therefore, when getting ready to buy a car be sure to research the fuel-efficiency of the model. For any questions on the right car for you, ask anyone on our sales team – we are here to assist you in making a perfect choice.